Left to right: Luke Daunivalu, Amena Yauvoli and Samuela Lagataki were endorsed by the United Nations climate body to be in its specialised bodies. Photo: Ministry of Foreign Affairs. 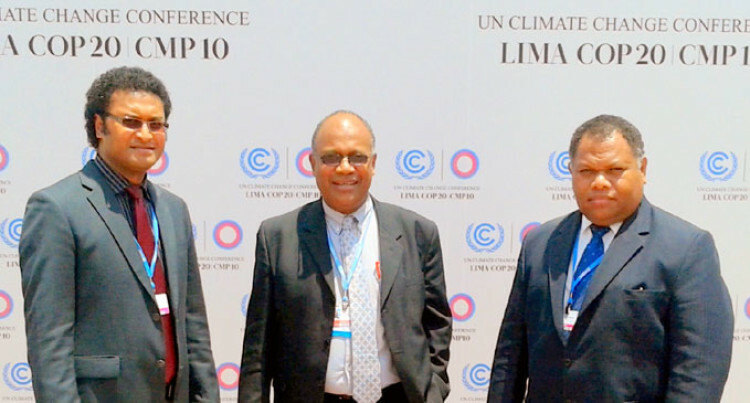 Fiji’s contribution towards addressing global climate change challenges was given recognition when the United Nations climate body endorsed the election of three Fijians into its specialised bodies. Amena Yauvoli, Luke Daunivalu and Samuela Lagataki were supported by the Alliance of Small Island States to represent the interests of Small Island Developing States (SIDS) in the various bodies established under the UN Framework Convention on Climate Change (UNFCCC). This is to deal with specific climate change areas. In a show of support and endorsement for his leadership this year as chair of the UNFCCC Subsidiary Body of Implementation (SBI), Mr Yauvoli, Fiji’s Permanent Secretary for Foreign Affairs, was re-elected as chair for another year. The SBI is one of two permanent subsidiary bodies to the Convention established by the Conference of the Parties (COP) and the Conference of the Parties serving as Parties to the Kyoto Protocol (CMP). It supports the work of the COP and the CMP through the assessment and review of the effective implementation of the Convention and its Kyoto Protocol. The SBI also advises the COP on budgetary and administrative matters. Mr Lagataki, Fiji’s Conservator of Forests, was also elected as the Alternate Member of the Adaptation Fund Board. He replaces the late Ambassador Peceli Vocea as Fiji’s and SIDS representative on the Board and will serve for a two-year term. Considered an important mechanism for catalyzing funding support on adaptation, the Adaptation Fund was established in 2001 to finance concrete adaptation projects and programmes in developing country Parties to the Kyoto Protocol that are particularly vulnerable to the adverse effects of climate change. “I am humbled at my appointment and am happy to take up this important responsibility. I see the role of the Fund as critical to ensuring that appropriate development and climate adaptation reaches the most vulnerable communities in island states,” Mr Lagataki said. Over the past four years, the Fund has dedicated more than $265 million to increase climate resilience in 44 countries around the world. The 43 member States of SIDS also showed their confidence in Mr Daunivalu, Deputy Secretary of Foreign Affairs, as their representative on the Adaptation Committee for another two-year term. Daunivalu was one of the first members to be nominated to the Committee after it was launched in. 2015 represents a major milestone for the international community with a new climate agreement to be adopted at the climate talks in the French capital of Paris (COP21) from November 30 to December 11.